Three equal horizontal bands of green (top), yellow (middle), and red (bottom), with a yellow pentagram and single yellow rays emanating from the angles between the points on a light blue disk centered on the three bands; Ethiopia is the oldest independent country in Africa, and the three main colors of her flag were so often adopted by other African countries upon independence that they became known as the pan-African colors. Addis Ababa, the largest city that is the seat of the federal government of Ethiopia, lies in the central plateau at an altitude of 2,400 meters. Its average temperature is 16oc. Addis Ababa was founded in 1887. It is a host to the African Union (AU) and the United Nations Economic Commission for Africa (ECA). Several other international organizations have their head quarters and branch offices in the Capital. Addis Ababa is also the center of commerce and industry. Ethiopia’s other important centers of trade and industries are; Hawassa, Dire Dawa, Gonder, Dessie, Nazareth, Jimma, Harrar, Bahir Dar, Mekele, Debre Markos and Nekemte. All these towns are connected to Addis Ababa by asphalt and gravel roads and most of them have good infrastructure facilities, such as first class hotels and airports. Land Area: 1.14 million Sq.kms (440.284 sq. miles) out of which 1.07 million sq. kms is land and 7.0 thousand sq. kms is water. Amharic is the official language of the Federal Government. English is the medium of instruction at secondary schools, Universities and Colleges and is widely used in business transaction. Oromiffa, Tigrigna, Somali, Guragigna, Sidama, Afar are among the most widely spoken besides Amharic. Arabic, French and Italian are also spoken. Ge’ez is a script used as an abugida or syllable alphabet for several languages of Ethiopia and Eritrea but originated in an abjad or consonant-only alphabet used to write Ge’ez. In Amharic and Tigrinya the script is often called fidäl which means “script” or “alphabet”. The Ge’ez or Ethiopic script possibly developed from the Sabaean/Minean script. The earliest known inscriptions in the Ge’ez script date to the 5th century BC. At first the script represented only consonants. Vowel indication started to appear in 4th century AD during the reign of king Ezana, though might have developed at a earlier date. Telephones: main lines in use: 725,000 (2006); mobile cellular: 866,700 (2006). Radio broadcast stations: AM 8, FM 0, shortwave 1 (2001). Television broadcast stations: 1 plus 24 repeaters (2002). Internet hosts: 89 (2007). Internet users: 164,000 (2005). Transportation: Railways: total: 699 km (Ethiopian segment of the Addis Ababa-Djibouti railroad) (2006). Highways: total: 36,469 km ; paved: 6,980 km; unpaved: 29,489 km (2004). Ethiopia is strategically located in the Horn of Africa, 3′ and 14.8′ latitude 33′ and 48′ longitude bordering Somalia, Sudan, Djibouti, Kenya and Eritrea with a total border length of 5,311 km. It is the 10th largest country in Africa. Its proximity to the Middle East and Europe, together with its easy access to the major ports of the region, enhances its international trade. Ethiopia’s generally high altitude offsets the effects of its position in the tropics, just to the north of equator. Temperatures are cool at night and the main rains are usually very heavy in the lowland fringes the climate can be uncertain. The main rain begins at the end of June in addis abeba, slightly later in tigray, and peter out during September. There is often short rain (belg) about ester when another planting is also possible. The southern part of the country is influenced by the monsoons blowing from the Indian Ocean. Temperature varies with altitude. 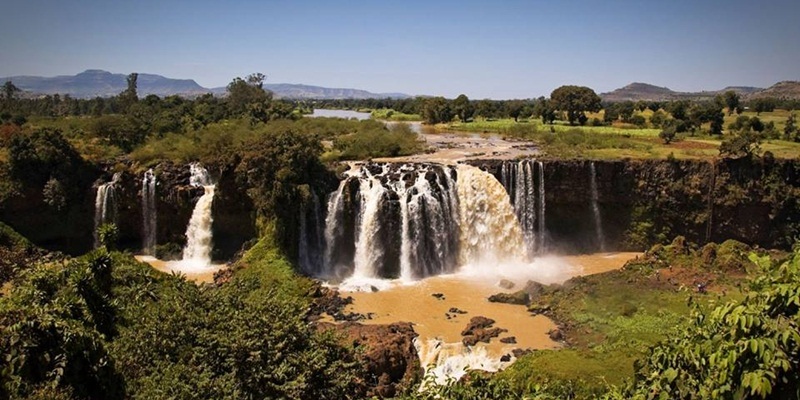 In Ethiopia there are three zones a cool zone (Dega) in the highest mountains; the temperate (woyna dega) zone and the kola zone in desert and at the bottom of big river gorges. The music of Ethiopia is different, with each of Ethiopia’s ethnic groups being associated with unique sounds. 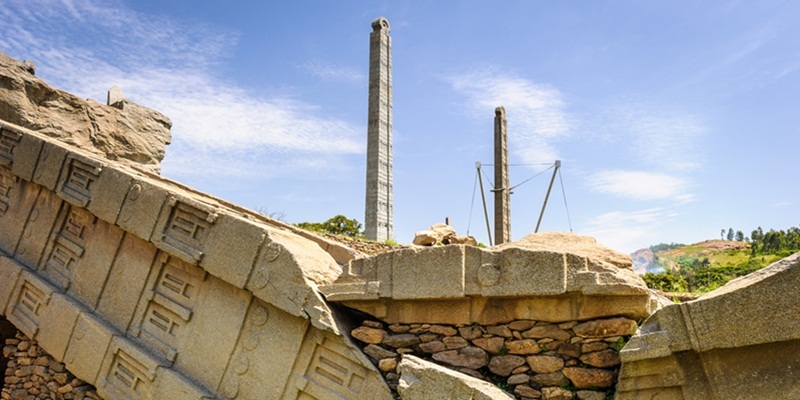 Ethiopian religious music also has an ancient Christian element, traced to Yared, who lived during the reign of Gabra Masqal in northeastern Ethiopia, in Wollo. Kirar is the highlands, traditional string instruments with a six-string lyre; Begena is a large ten-string lyre. The Dita a five-string lyre and musical bows including an unusual three-string variant are among the chordophones found in the south.and also Masinko a one-string bowed lyre. Washint is a bamboo flute that is common throughout or in the highlands. Trumpet like instruments include the ceremonial Malakat used in some regions, and the holdudwa is a animal horn; compare shofar found mainly in the south. Embilta flutes have no finger holes, and produce only two tones, the fundamental and a fourth or fifth interval. These may be metal generally found in the north or bamboo in the south. The Konso and other people in the south play fanta, or pan flutes. kebero is a large hand drum used in the Orthodox Christian liturgy. Smaller kebero drums may be used in secular celebrations. The Nagarit, played with a curved stick, is usually found in a secular context such as royal functions or the announcement of proclamations, though it has a liturgical function among the Beta Israel. The Gurage and other southern peoples commonly play the atamo, a small hand drum sometimes made of clay. The Ethiopian traditional costume is made of woven cotton. Ethiopian men and women wear this traditional costume called Gabbi or Netella. Women often wear dresses Kemis and Netella with borders of coloured embroidered woven crosses, but other designs are also used. Other ethnic groups and tribes in the south and west of the country wear different costumes that reflect their own traditions. Some tribes partially cover their body with leather but others do not wear any clothes at all, merely decorating their faces and bodies with distinctive images. These traditional clothes are still worn on a day-to-day-basis in the countryside. In cities and towns, western clothes are popular, though on special occasions, such as New Year (Enkutatash), Christmas (Genna) or weddings, some wear traditional clothes. The Ethiopian national dish is injara with wat. Injera large spongy pancake made of teff flour and water. Teff is grown on the Ethiopian highlands. Wat can be mead from different vegetable and grain seed e.g. chicken, beef, lamb, vegetables, lentils, and ground split peas stewed with hot spice called berbere. Berbere is mad e of dried red hot pepper, herbs, spices, dried onions, dried garlic and salt ingredients. Wat is served by placing it on top of the injera which is served in a mesob . The food is eaten with fingers by tearing off a piece of injera and dipping it in the wat.Ethiopian Orthodox Tewahedo Christians do not eat meat and diary products (i.e. egg, butter, milk, and cheese) on Wednesdays and Fridays and in a fasting seasons. Doro wat is the best known food from Ethiopia and is often referred to as that country’s national dish is made up of tender chicken with seasoned butter and stewed in red pepper sauce, flavored with onions garlic, ginger root and pinch of cardamom for m and usually eaten during holydays. The favorite drink of many Ethiopians is bunna (coffee). Bunna is drunk in Ethiopia in a unique and traditional way known as a “coffee ceremony”. First the coffee is roasted, then ground and placed in a Jebena (coffee pot) with boiling water. When ready it is then served to people in little cups, up to three times per ceremony.Other locally produced beverages are tella and tej, which are served and drunk on major religious festivals, Saints Days and weddings. tella is made of different grain seed served with cap or Tasa and Tej is made of honey and served with glass made cap called Berelay ,Tella and tej are also sold by numerous designated commercial houses all over the country. The most known Sport in Ethiopia is the middle-distance and long-distance runners. They are the World Championships and Olympic winners. The Ethiopian national football team won the 1962 African Cup of Nations. There are also traditional sports events, such as stick fighting which is popular amongst the Surma and Nyangatom people. In 2001 Great Ethiopian Run an independent non-governmental organization (NGO) has staged over 60 races in different parts of Ethiopia with charity purpose. Great Ethiopian Run is an independent non-governmental organization (NGO) (as well as ActionAid) operating in Ethiopia since 2001 with the mission of staging mass-participation athletic competitions in Ethiopia. In recent years Great Ethiopian Run focus has been on taking mass-participation races to all corners of Ethiopia; developing capacity in the office and event teams which are staffed by Ethiopians; and working with sponsors on a range of publicity campaigns. The Great Ethiopian Run isn’t 10k run as it takes place half-way across the world in Addis Ababa,Ethiopia capital with 33,000 participants it is Africa biggest road race and at an altitude of 7,600 feet in hot Ethiopian temperatures.Since its inception in 2001 Great Ethiopian Run has staged over 60 races in different parts of Ethiopia. Many international runners, tourist’s children, old and young peoples and tourists are participants in Africa biggest road race. 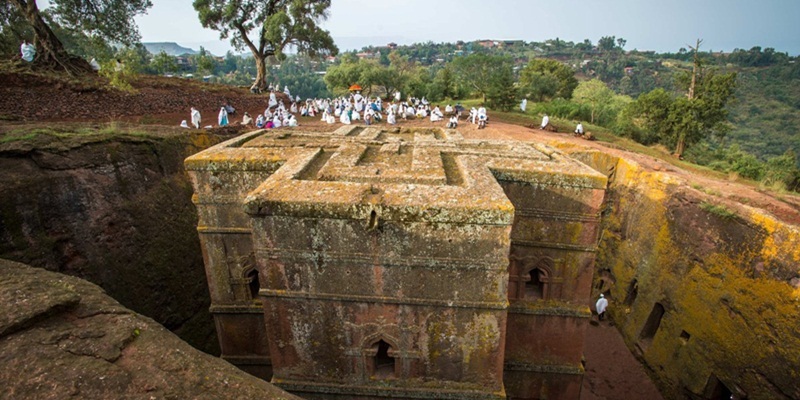 Public holidays in Ethiopia follow the Ethiopian Orthodox Tewahedo Church as shown below. 3.March 2 – Victory at (Commemorates the victory over the Italian army under Oreste Baratieri in 1896. 7.May 5- Patriots’ Victory Day (Commemorates the liberation from Italian occupation by the Allies during the East African Campaign of 1941.